The latest offering from Amrut, the 'Naarangi' derives its name from the Hindi word, Naarangi which means Orange. It is the only single malt whisky ever produced in the World to have expressions of Orange, which brings forth a new level of experimentation to the malt world. 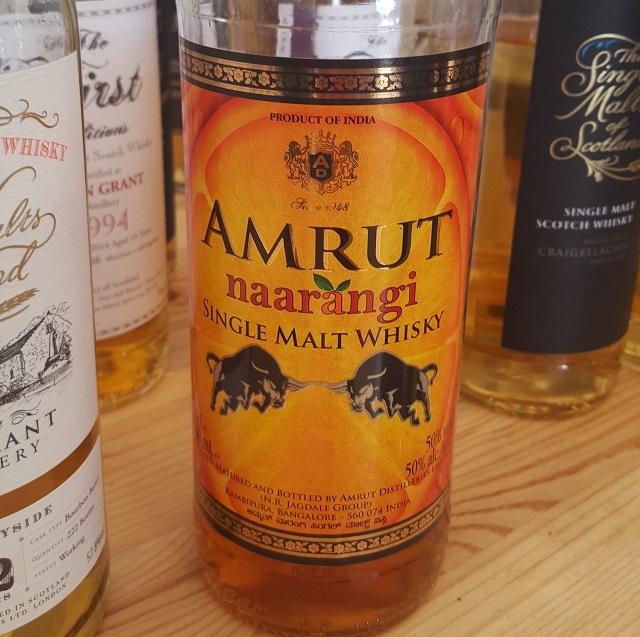 EU regulations for malt whiskies state that adding anything to a whisky disqualifies it from being called a whisky, however, Amrut who had been contemplating adding Orange notes to whisky have developed a novel solution to create Naarangi which meets all EU guidelines. To produce this whisky, Amrut procured Olorosso Sherry from Spain and matured wine along with Orange peel in it for a period of three years. [...] The wine and orange peel concoction was let to mature for 3 years in Bangalore, lending the barrel a unique Orange essence. The wine and peels were then spilled and the barrels were filled with 3­‐year­‐old matured single malt whisky and allowed to mature for 3 more years. In this period the barrels have lent the Orange characteristics to the whisky creating a pioneering single malt. The whisky was bottled in December 2014, with a total outturn of 900 bottles. Amrut Naarangi is available in Sweden at SEK 929 (item number 85741). Nose (22/25): I did not know anything about this whisky before I got the glass in my hand. I have read reviews, but unfortunately I have a bad memory... Well, when Lars served me this whisky and I nosed it, the first thing I came to think of was oranges! Then Lars told me how the whisky was made... so I am happy I recognized the oranges! The nose was warm and rich. In addition to the oranges I found it to be fruity and fresh. Found a lot of eucalyptus and mint. And some Indian spices. Taste (22/25): Very warm, smooth and rich. Oranges, peaches and tropical fruits like pineapple and mango. Some spices here as well. Finish (22/25): In the end the spiciness takes control and gives the whisky a warm and long finish. I found white pepper, licorice and orange peel. Balance (23/25): I really liked this Amrut. Quite different from the other Amruts I have tasted, but just as good.